Happily Ever After!! 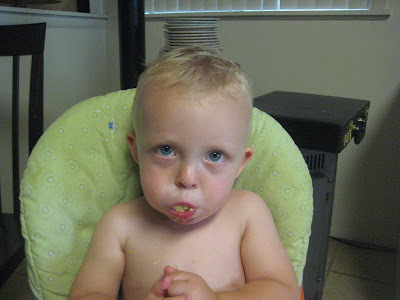 : Funny Eater! Growing up my family always ate dinner together. I believe that the dinner table is one of the most important and memorable furniture items a family can own. This is one tradition I try to do every night for my own family. I am not sure why I love to watch Grant eat, but I do!! This is a little boy who knows what he likes!! I have had to be come creative when cooking, because I want him to be healthy and not face weight issues (seems to be a big problem with kids these days!!) I borrowed my mom's wheat grinder and have found out that Grant will eat wheat pancakes just as much as he'll eat regular ones. I've learned about making different kinds of quick breads, and muffins with wheat. It's actually been fun, and I've enjoyed eating these treats too! 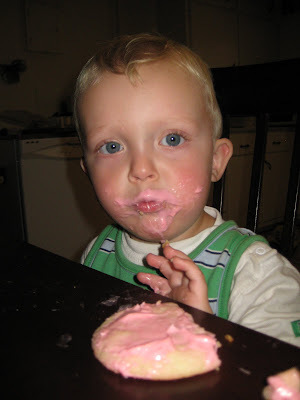 If you look closely at this cookie, you'll notice that it's covered in frosting... Oh wait, it's all over his face! It's not healthy. At all. We tried decorating them, but he just wanted to eat the frosting. Mark kids that he is just like his mommy... What?? I like (ok LOVE) frosting! It makes the cake! Grant loves pasta! I am always looking at new recipes everywhere online. I came across a buttermilk chicken and spaghetti squash recipe and decided to try it. It actually was pretty easy to make. Ta-dum, Grant LOVED it. And I think Mark was ok with it too! At our house we only have swamp cooling (YUCK), and so I try and grill as much as I can. One night we had tin foil dinners out on the grill. 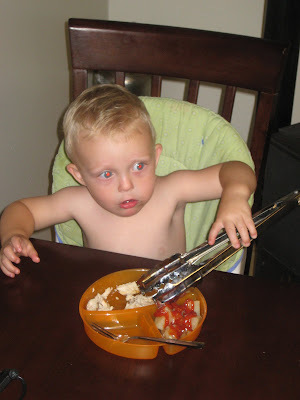 Grant would NOT put down the tongs!! He even bathed with them!! I didn't mind, I thought it was pretty funny! 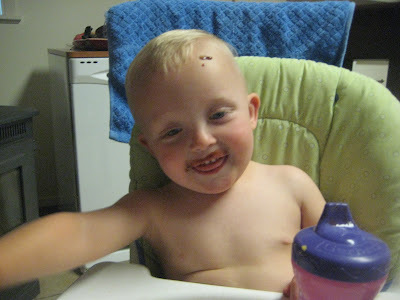 Recently, Grant has started to eat as much as possible, in as little time as possible. Ok, ok, he does get the big mouth from me. FYI, it was a 1/2 a banana!! GROSS!! My little man!! I just love watching him eat. He just ends up doing the funniest things!! I am blessed to have such a healthy little guy... Hope you enjoyed a few moments of our dinner time! 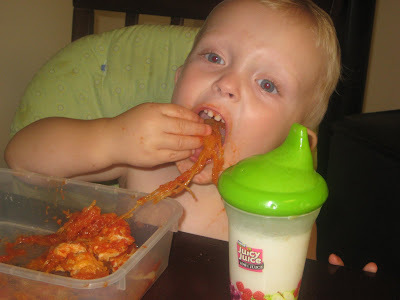 I love pictures of little kids eating. They don't care were the food goes. You're such a good momma :). Laughed at the tongs. Funny when kids attach themselves to things then carry them around for a few days. We love spaghetti squash at our house too!